Built in 1852, replacing the Mariners’ Church, to a design by Charles Wilson. 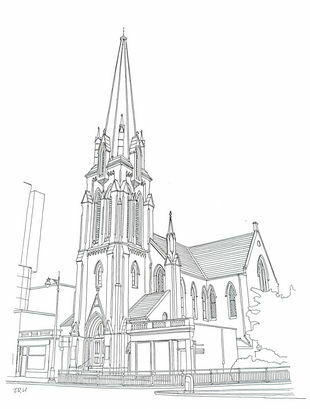 It ‘boasts a fine spire terminating the elevation of Nethergate’. Hammerbeam roof. Organ by Walker & Co 1902, overhauled by Rushworth & Dreaper 1971. Stained glass, some by Jones & Willis, and by Alexander Russell. Sets of tapestried pulpit falls, tapestry kneelers. Doorway mosaics by Elizabeth McFall. A hall complex, M J Rodgers 1988, the location of regular meetings of Presbytery of Dundee, as well as providing storage for the Presbytery Resources Centre. A feature of the garden is an artistic stone wall by David Wilson.